Just thought I'd pop in to mention that I took down a medium sized Japanese maple today using the pole pruner to take the highest branches off first, then sectioned the trunks until I got to the base which was 8" across, then used my chain saw to cut that off at the ground. It works great - no chain loosening, cuts nicely - made my job faster and easier. I also found a use for the cultivator attachment. A few weeks ago, I used it to "dethatch" my back yard, and then scuff up the soil in preparation for reseeding the many bare spots. That is great! How often are you finding you need to sharpen the blade after such work or do you simply replace it? Not sure. I've only used the one unit a few times. If I find it seems dull, I'll pull the other one out of the box (I bought two of them) and drop off the first one to be sharpened. I don't know how to sharpen them, nor does it sound like something I want to be bothered with. Thought I'd post an update since it's been a while. So far, I have no real regrets about having purchased all of these "crap" items. Is the Yardman a great unit? No, but it's sufficient for what I need it for. I've found the pole pruner and hedge trimmer attachments to be the most useful. 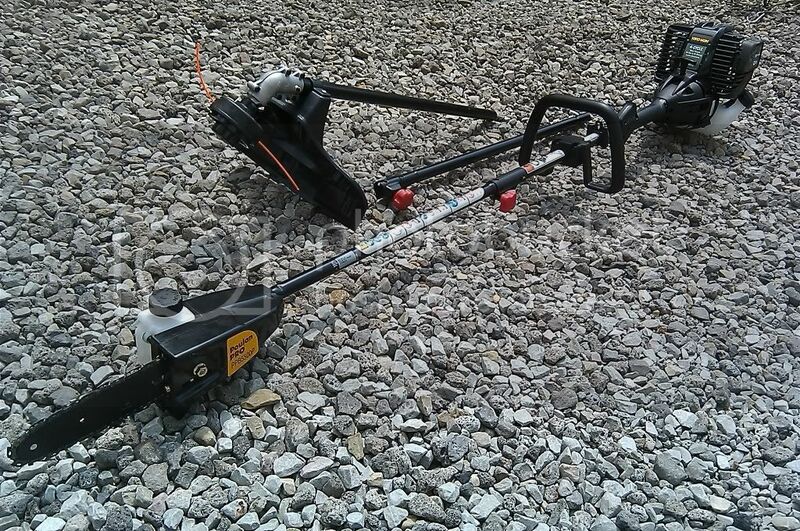 I picked up a Stihl edger attachment for my Stihl FS90R, so I don't really need to use the cheap one now. The string trimmer came in handy last week when my Stihl stopped working. The Yardman is slightly underpowered and spins the opposite direction, so that made it a bit frustrating to use for a few days while my Stihl was in the shop, but it allowed me to continue working. If I had to rely on these items for daily use, I think I'd be disappointed, but for occasional use, they are working out just fine. I have back ups for back ups lol. It does come in need. I had a hedge job and I brought 4 trimmers. I had problems with two right off the bat and the third had the pull cord get stuck. The weedeater trimmer was the only one that had no problem. Go figure! 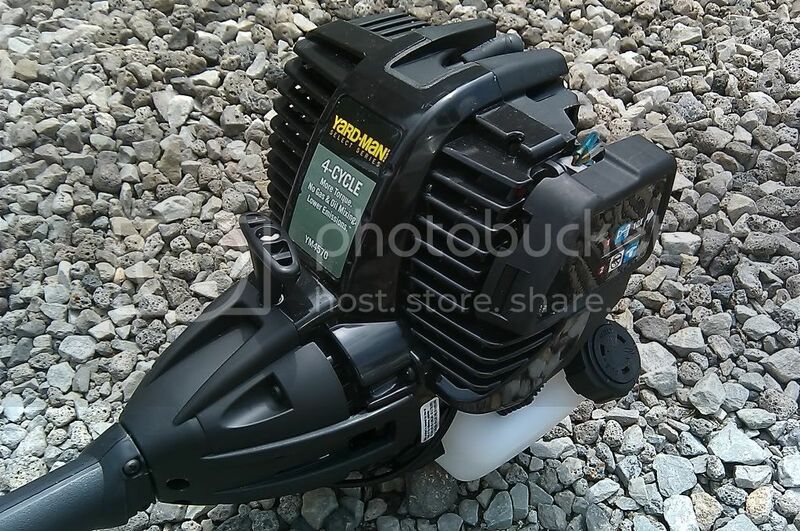 I havent noticed a big difference with commercial and homeowner hedge trimmers. There is a huge power difference with the string trimmers. Since there used more the reliability becomes a bigger issue. I always stuck with commercial trimmers. 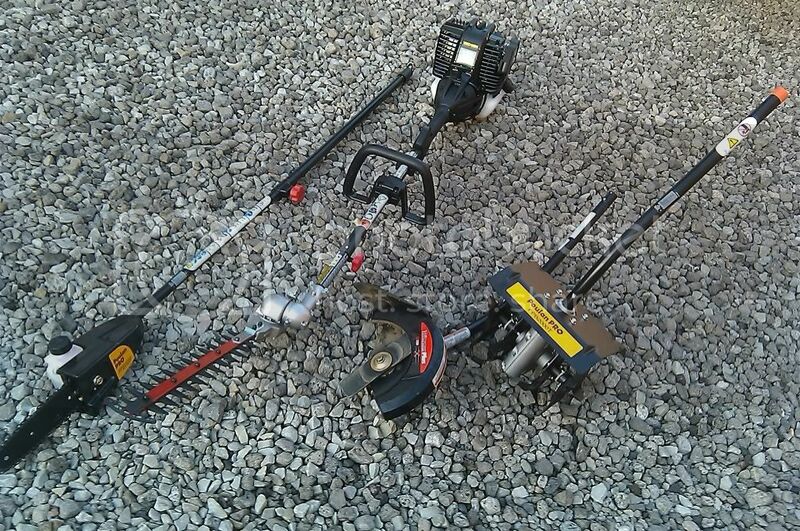 I do have 2 cheapo split shafts that I plan on getting a articulating trimmer for. These cheap, "piece of crap" attachments were without question, money well-spent. 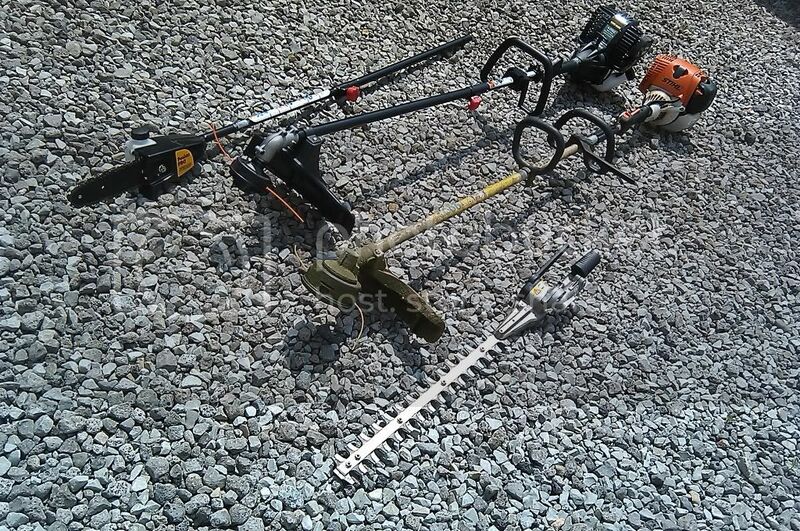 Over the last week alone I used the hedge trimmer attachment, the tiller, and the pole pruner/saw. I had to cut down a dozen clusters of ornamental grasses and about twenty large hostas. 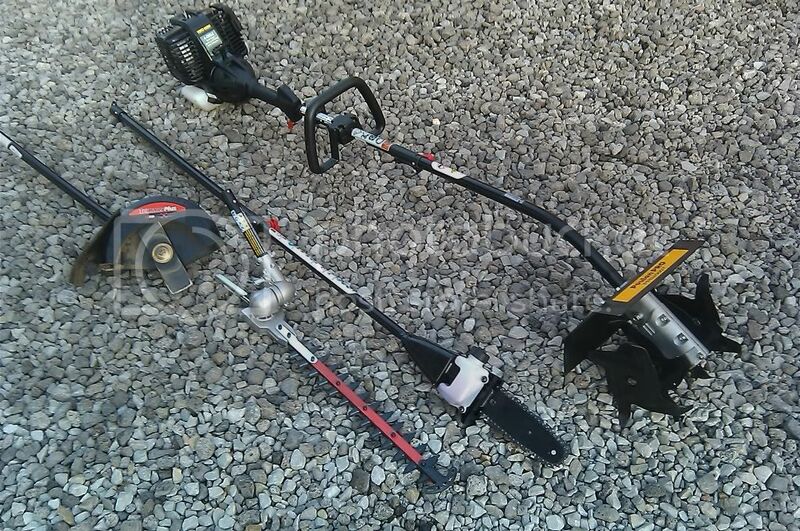 I'd NEVER want to run pricey, commercial hedge trimmers along the ground where they could be damaged by hitting rocks and/or other hidden dangers. Screw that - I'll use my $40 trimmer! It worked perfectly - I didn't even have to get down on the ground - just set the attachment at an angle and cut the grasses from the standing position. I used the tiller attachment to turn over a small garden and it worked great. It would never turn over hard soil, but it works great in an established bed - Much faster than using a shovel. The pole pruner got a workout today cutting down an overgrown row of shrubbery/rose of Sharon bushes. Some were simply too thick to cut with loppers and I had about fifty feet of it to cut, so I just used the "chain saw on a stick". Since the powerhead is a 4 cycle, I attached the pole pruner so that the saw was "sideways", that way the engine remained upright while I did most of the cutting, keeping the oil flowing to the internals properly. As I've mentioned, these will not hold up to heavy use, but for all the more I've needed them, they have been a great help. The biggest weakness in any of them is the connection points - some of the hardware has fallen off (I located and replaced it) and the shafts inside tend to want to slide out if you don't keep the protective end cap (included for shipping) on when not in use. I keep every piece in the back of the truck at all times (except the tiller) and have never regretted buying any of it. As you look ahead, wold you replace them when needed with the same product or do you feel you would need to get a heavier duty version of them? I use all that same stuff and am very happy with it, Mine is all Troybilt but they are both made by the same people "MTD" I have the TB 4 stroke head as well as the Craftsman 2 stroke head that both fit all the attachments, They also both fit the electric starter which I have as well and is WAY worth it. Last month I was asking about 4 cycle trimmers, as I wanted to get some sort of backup trimmer in case my Stihl should ever crap out on me. I figured I'd pick up something with a split shaft so I could then buy attachments for occasional use. At this stage in my business, I can't justify the expense of some of the commercial grade tools, so these should "get me by" until I can upgrade. I can then sell these off, or keep them as backups. Here's the thread I started regarding 4 cycle trimmers. 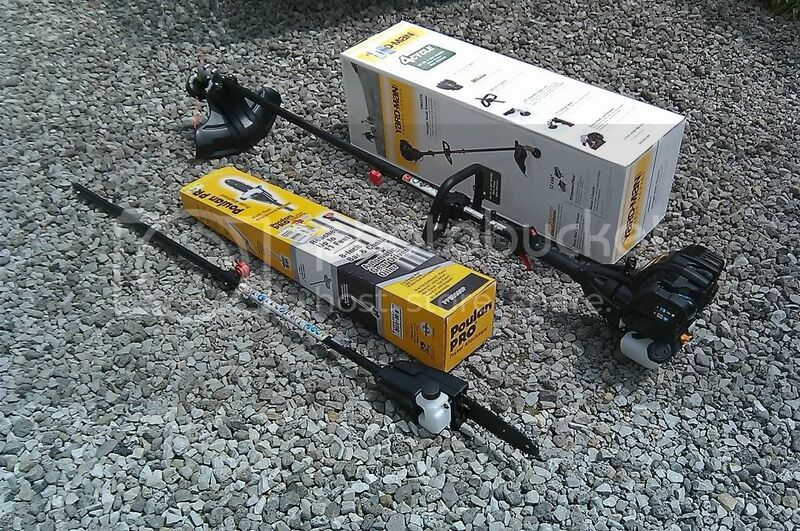 While I was there, I picked up a pole pruner attachment as well, and figured I'd wait for the other attachments to go on clearance before buying them. Note that the hedge trimmer attachment for the Stihl was absolutely worth the money - very well built and has been extremely useful. I highly recommend it. Also note my forward "dork handle". LOL! It looks retarded like that, but it weighs next to nothing, isn't in the way, and comes in handy when using the hedge trimmer attchment. The only one I've actually used so far is the edger. Since I've never used one before I couldn't tell you if it's any good. I mean, it worked, so woo-hoo! Hope the rest come in handy. They may be "garbage" compared to commercial grade units, but they are better than not having them at all, and until I can justify the added expense of commercial equipment, they will have to do. 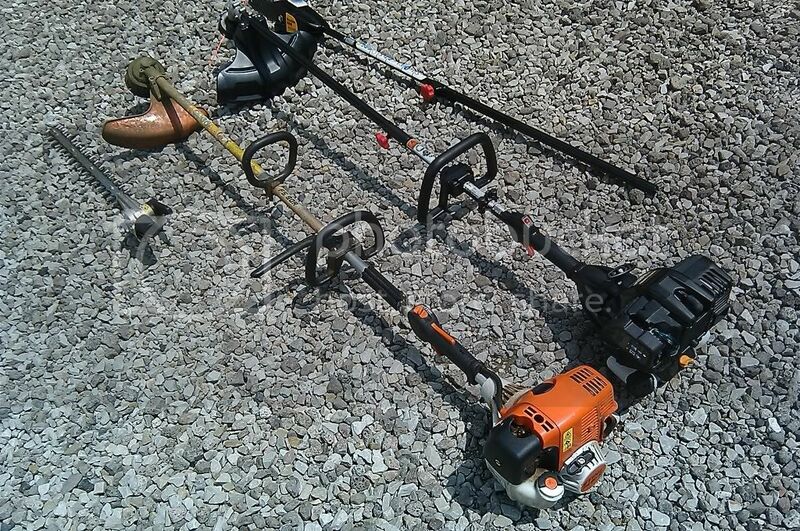 I already have a commercial hedge trimmer attachment for my Stihl line trimmer and I'll be getting a commercial pole pruner, but I still wouldn't use it for the "dirty work" I described above that these cheap tools can be used for. Why risk ruining equipment that costs HUNDREDS when you can use something that can be replaced for less than half the cost. Keep the good stuff for the good jobs. Guys...i got to tell you I hardly ever post, but I can tell you this; I bought the Poulan Pro 33 cc with the attachment system and that thing lasted three years of regular use. i also bought every attachment they make for it, and did so on clearance. The hedge trimmer works fantastic for those quick jobs. the pole saw is great for occasion use. The cultivate works great for small beds. I (to this day) still dont have a backpack blower, so the blower attachment was used extensively. 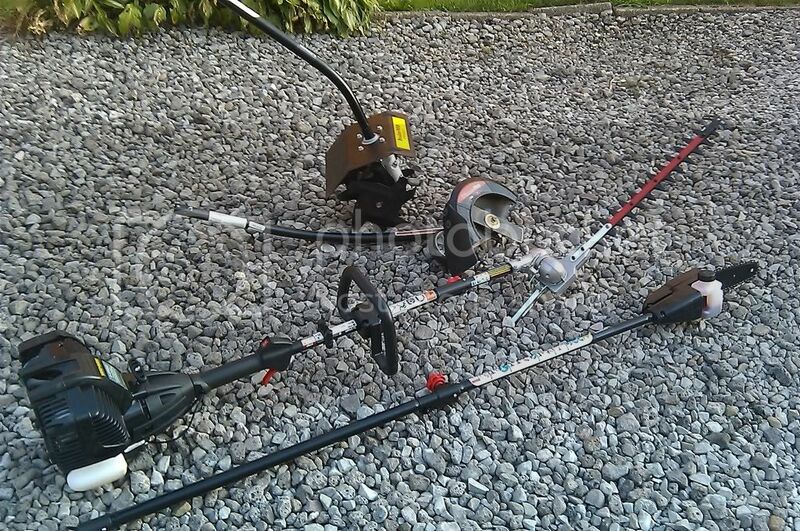 I started with only the poulan pro and used it for Trimmer Edger, and blower for every yard during my first year. As soon as I had the extra cas, I bought the Stihl FS90R trimmer. 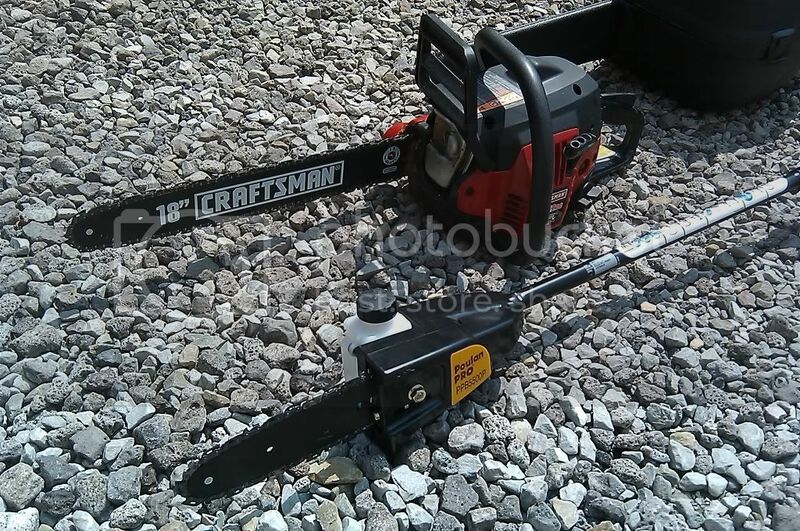 Then I bought a Stihl FC75 Edger. 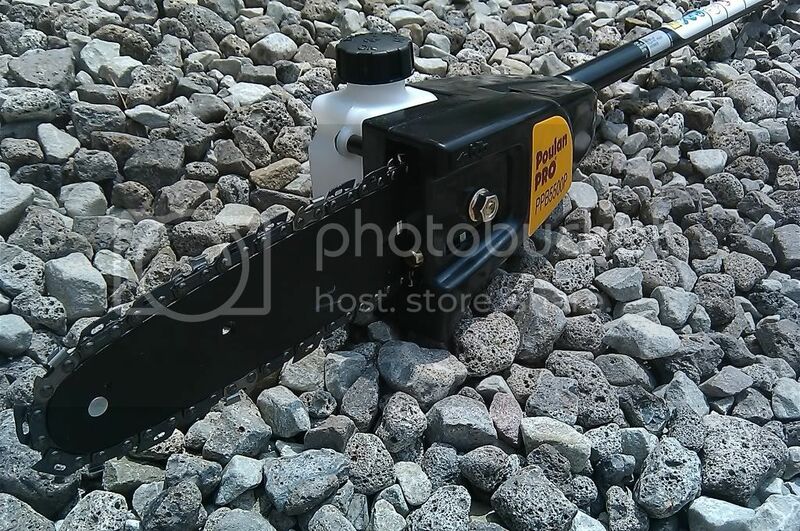 Long story made short, that poulan pro isnt going to be commercial grade and its a throw away item BUT>..if you take care of it, its a GREAT starter set, and becomes a great back up piece of equipment that can do those odd jobs such as hedge trimming, tree trimming, etc. I totally agree with Hedgemaster on this one. I HIGHLY recommend it as a cheap back up set. When it fails, its not that pricey to replace either. Just my 2 cents on it. No..its not commercial grade, so if you can afford the Stihl kombi, or something similar im sure it will be even better. But the concept remains the same. Last edited by rbljack; 12-08-2012, 08:41 PM. Click image and put on protective eye wear! That looked like it did a perfect job. It seemed that it's power and the requirements to til that section worked well together. So long as you don't expect it to be something it's not, it will do just fine. It was a lot less time consuming than turning the soil over with a shovel. 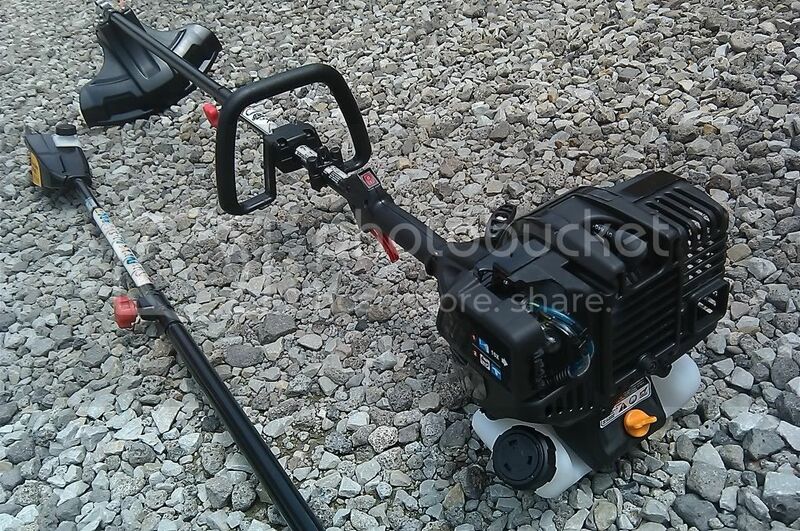 If I ever need to do a large garden, or turn over hard soil, I'll rent a rototiller. I've used the pole pruner saw twice in the last month. Once to trim some low hanging branches back and today I used it to cut a large, fallen branch in a client's lawn. A chain saw would have been overkill, but this thing was just the ticket. Still no regrets for any of these purchases. I WOULD regret it if I were using them daily because they clearly are not built for such use, but for what I have needed them for, that have been fine. The only bad thing I can say is that the parts that hold the shafts inside tend to get loose. One fell out of my pole extension, rendering it useless, so I'm extra careful when taking any of the sections apart now. 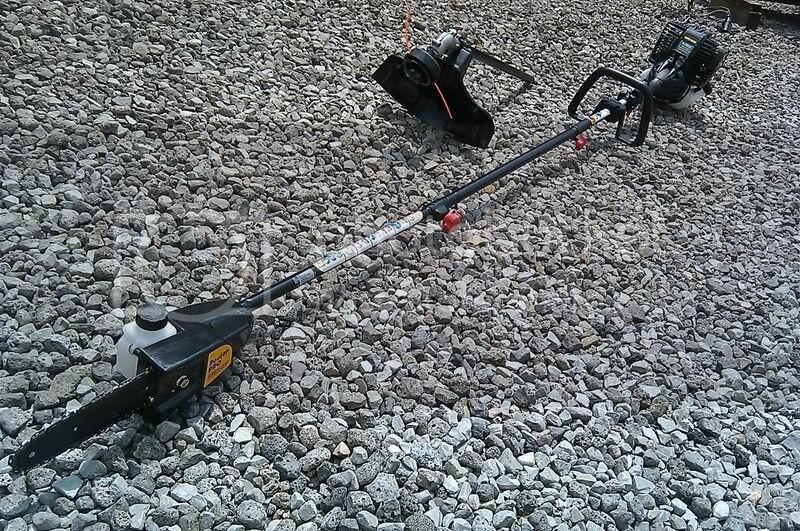 I would NOT recommend this unit as a string trimmer for daily use. It is way too underpowered. Also, it would not hold up well to daily handling due to the cheap plastic parts.